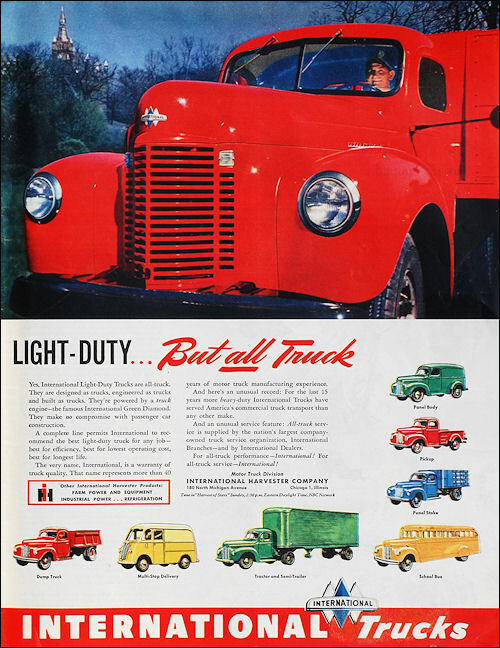 Yes, International Light-Duty Trucks are all-truck. They are designed as trucks, engineered as trucks and built as trucks. They're powered by a truck engine – the famous International Green Diamond. They make no compromise with passenger car construction. A complete line permits International to recommend the best light-duty truck for any job – best for efficiency, best for lowest operating cost, best for longest life. The very name, International, is a warranty of truck quality. That name represents more than 40 years of motor truck manufacturing experience. And here's an unusual reCord: For the last 15 years more heavy-duty International Trucks have served America's commercial truck transport than any other make. And an unusual service feature: All-truck service is supplied by the nation's largest company-owned truck service organization, International Branches – and by International Dealers. For all-truck performance – International! For all-truck service – International!